Shakespeare. The Bard. A true genius in literary circles. Ask anyone with an advanced degree in the subject. And some without a degree at all concur. That didn’t stop me from teaching OTHELLO in four sophomore classrooms a few weeks ago. What I mean by “teach” is to let an audio recording read Act IV to the class while I paused occasionally to ask clarifying questions and double-check for understanding. And once to just point out the lovely irony the Bard does so well which I do like. The students had time to write a summary and pick out some figurative language for their assignment. I admit, by class three, I was commenting on some of the personification in one of Othello’s monologues. Then I played the 1995 movie. Kenneth Brannagh plays Honest (HA) Iago and Laurence Fishburne (Morpheus from MATRIX) takes the title role. We watched Act IV. Yes, I did this four times. I was playing Words with Friends and scrolling through Facebook during the movie the last few times. Although I did chime in when something was clarified once they could SEE it played out. Shakespeare scripts were meant to be seen not read. No matter what you say, I will not be pursuaded from this. If there hadn’t been movie adaptations for the nine plays I had to watch in my college Shakespeare class, I would have failed it. The man didn’t even give stage directions. You need the actors to interpret it for you and then learn from their actions. Oh, young man, we certainly do need to study (not read) Shakespeare and other classics. But it’s time to be honest, high school students aren’t getting much out of it. Use something modern that alludes to the classic. In preparation for writing this post, I Goggled “Why teach classics in high school?” Links back to many of the articles I found on the subject will be included. One article on an Advanced Placement literature help site claimed it was a disservice not to teach classics. One of the main arguments was because so many modern references derive their meaning from classical literature. It’s true. As an aside, I fully believe advanced literature courses should cover the classics, and only the classics. Those students are preparing for college and they’ll need the analytical skills a great literature class teaches. For the average student, I might recommend a book like THE WEDNESDAY WARS by Gary D. Schmidt. In it, the narrator is forced to study Shakespeare while every other student in his class goes to their weekly religious classes. The students will engage with this novel’s story, and teachers can take time to delve slightly into the Shakespearian references that are made. In this way, the class stays engaged with the reading, and those who find Shakespeare interesting have now been given a sample. They’re free to check him out of the library or binge watch him on Netflix. Pair a small bite of a classic with something more current. Most students shut down when you show them an old story. They don’t care how much it influenced literature or society. All they care about is that it is OLD, and therefore doesn’t relate to them. Students of literature know better. But general high school classes aren’t meant to make literature buffs out of students. What is the purpose of literature class in high school? Go ahead and Google it. I did. Students think the purpose it so learn to research a topic and write an essay on it. Teachers think it’s about grammar, vocabulary, reading and comprehension of broad categories (so why do they have to read a Shakespeare play in every year of high school? ), studying the literary culture of English societies and organizing information and communicating it to others. Oh, they say the research and citation aspect is also important. In any case, there is no reason to wade through hundreds of pages of classical literature to learn these skills. In the era of memes and movies, students want to be entertained. If you entertain them, they’ll learn more. Ignoring the culture of learning is antithesis to teaching. Great educators can adapt their methods to fit their students. I know this because I worked in a special education classroom for ten years, and in that room, it was all about adaptation. Invest in different formats of the classic. I’m not a fan of graphic novels. I want words or I want pictures. That doesn’t mean the upcoming generation feels the same. If we can put To Kill A Mockingbird in a more accessible format without damaging the beauty of the original language, why wouldn’t we do it? If a student will read the book in graphic novel format, isn’t that better than if they don’t read it? You say you’ll read it aloud in class. Fine, but we know how easy it is to tune our brains to something else when we’re not interested in the topic at hand. The key is in making adaptations that maintain the integrity of the original. And companies are trying to do it. Schools should make a market for this important work by investing in new books in a format that engages their students. Put the classic into historical context. Many of the posts I read on the subject said the most important reason for studying the classics was because of the cultural insight it imparts. Wouldn’t this be better off in history class then? I’d argue for the combined humanities courses that fall in and out of favor in our state’s middle school environments. That’s a perfect age to marry these two subjects. But those students aren’t going to wade through UNCLE TOM’S CABIN to understand the American cultural climate. Good grief! I barely managed to wade through it as a junior in high school and I was an advanced reader and writer who devoured any book that was handed to me. Except that one. But I did slog through it. An excerpt or two could be gleaned from the text on the pertinent cultural lessons. This way, students can access the benefits in a dose they can handle. Curate the substance and present it in a medium students relate with. English and literature teachers are the experts on the subject matter. However, they aren’t meant to make experts of their students. That’s why there are curriculum learning objectives. As an author, I have to kill my darlings if I want to produce stories that readers will read. This means brilliantly written scenes get cut from the manuscript and filed in my “cut scenes” document. High school teachers need to do the same. Is symbolism in literature an important thing for students to grasp? And if it is, then choose a modern book they are familiar with (one that has a movie to go along with it) to teach it. Why? Because using a source they aren’t interested in to teach them a subject they think is pointless is only going to frustrate everyone. They won’t learn, and you’ll feel like a horrible teacher. The English department at every high school needs to have a round table. The state mandates the learning objectives. Let the teachers decide which literature is best suited to the objective and the audience. Too often, thought isn’t given to the audience. For an author, that’s the top of an ice-slick slope with an avalanche brewing at your feet. It’s time teachers realized it puts them in a precarious position to only think about what they want to teach instead of how their students will best learn. What are your thoughts? Did you LOVE reading ROMEO AND JULIET in high school? Are there other ways to teach classics to teenagers who play video games and watch movies rather than read? The Great Gatsby stalks me from one high school language arts class to the next. In St. Helens, he prowls through the junior classrooms and in Scappoose, his story resounds with the freshmen. This disparity in curriculum gave me pause. After all, I’ve taught students between the ages of twelve and eighteen for many years. There is a huge difference in the analytical abilities of freshmen (fourteen or fifteen-year-olds) and juniors (sixteen and seventeen-year-olds). Can Gatsby’s theme and content bridge this gap? Will freshmen understand the depth of Fitzgerald’s message in the same way juniors do? The proof is in the pudding. And I won’t be around to see the end product. In the freshmen classroom, the project due at the end of the reading is a theme timeline. This is an art-heavy project. Students will identify the (a) theme of the book and create a timeline of events that support that theme. As I talked about in a recent post about theme, it must be evidence-based using words from the text rather than experience-based. If these students can prove their interpretation with sufficient text examples, they will have nailed a theme. I believe there are many, but Nick Carroway does a fair job of stating an obvious one in the first paragraph of the novel. You can’t judge a person because you don’t know what they’ve been through. Everyone judges Gatsby as a successful and wealthy man who loves throwing parties. He’s affable and generous, and everyone is happy to take part in his excess but none of them show up to pay respects at his funeral. So what sort of person was Jay Gatsby really? I’m not sure we really know. A poor man who sought his big break and found it, but all the success in the world couldn’t overcome his insecurities. His life ended before he could reap the benefit of finding true love with Daisy. The juniors are focusing on the symbolism in Fitzgerald’s classic novel. There is plenty to be found. The one chapter I read with these students had several symbolic things in it, but many of the students missed their significance. Even when I stopped and asked leading questions, they blanked out. I fear the teachers will be disappointed at the outcome of this assignment. Like theme, symbolism is one of those things that gets emphasized in high school (and college) literature classes. Symbols can be subject to interpretation. I spoke more about that in this post about Blue Being Blue. In my mind, symbols take more time to recognize. The harder you have to look for one, the more unlikely it is to be one. When analyzing a novel, only obvious symbols should be considered (as far as I’m concerned). I believe symbolisim requires deeper reflection on a text, so perhaps the varied focus of the curricula explains things. The choice of this text for students at different intellectual stages of development might make sense in this case. No one argues the state of The Great Gatsby as a classic. It should certainly be part of a robust literary education. As an author, I rarely give thought to symbolism in my writing and thought of theme is something done during revisions. Since I write genre fiction, that’s to be expected. Nothing I write will be considered a classic. No one will teach my short stories or novellas in their English class. I’m sort of glad about this. Even speaking to readers about my books can be disheartening if they don’t “get” what I wanted to say. The thought of some English teacher claiming the technology in the follow up novel to “The Demon Was Me” represented evil as much as the demons makes me cringe. Mostly because I didn’t even want my demons to represent evil. They were being trying to survive, and the way they did it destroyed regular people. Can you see a deeper truth in this? One that might be important for young adults (the intended audience) to understand? I think students in today’s classrooms would be more engaged if more contemporary novels were taught in classrooms. My experience teaching a group of middle school students Hunger Games proves this point. They were low readers, many with language disabilities, so they missed much about theme and symbolism, but they could plot out the story and relate the character arc of Katniss Everdeen. Doesn’t appreciation of story have a place in a language arts classroom? Fitzgerald is a notable wordsmith. His descriptions are lovely and borderline purple prose. Since he puts so much of himself into a story, readers feel intimate with the characters. But most of his stories are lacking on plot. Maybe teaching one literary classic per year would suffice in high school English classes. Introduce reluctant readers (which most young people are these days because…technology) to a few masters. Let the assignments practice important life skills: like disseminating essential information and conveying ideas with clarity. Because how often have you needed to identify a theme or recognize symbolism in your day-to-day life? It’s nice to want kids to broaden their horizons and look outside the box for beauty, but if they can’t balance their checkbook or hold down a job, does that truly matter? What classics do you believe are essential for every young American to read? What skills should be taught in language arts classes? Two classes of fifteen juniors in high school read the same story and come up with completely different themes for the story. What truth about theme could this possibly prove? As an author, I think about theme. I don’t generally think about theme when I’m first drafting a story. At least not in the concrete way English teachers try to teach it. Since I prefer reading plot driven stories, those are the kind I generally write. Of course, they involve interesting and relatable (I hope) characters who will change, learn and/or grow by the time the plot culminates. On this particular Wednesday, I read the short story “Love in LA” by Dagoberto Gilb (an award winning short story author) to (or with) two different classes of 11th-grade students (mostly girls, by the way). Jake rear-ends a cute, young babe with his ‘58 Buick. Her brand new (‘93) Toyota doesn’t fare so well. You might think this is a story about these two hitting it off and ending up in love, but this is “Love in L(os) A(ngeles)” so that’s not what happens at all. Instead, she tries to get the information she needs to get her car fixed while Jake tries to get her phone number. The lesson for the day was a Socratic Seminar around this story. As the substitute teacher, I was the facilitator, and I had to insert a few more ideas during this class period. It was before 9am, so most teenagers lack full cognitive functioning. I read the first paragraph (the longest one in the story) and one of the students read the rest. She had a difficult time keeping her eye rolls at bay in some areas. Jake fancies himself to be quite the charmer, but even his target realizes he’s more of a con man. The first and last paragraphs refer to freedom in contrast to the sticky situation in Los Angeles at that moment, a traffic jam. After more than 40 minutes of discussing Gilb’s methods of characterization and what the title had to do with the story, the students were asked to write what they believed the theme was. It was like pulling teeth to get someone to have the courage to share theirs. This group of all girls came in, energized from the lunch break they’d just had. They were chatty, but not disrespectful and happy to discuss the literature at hand. After I read the story to them, that is. In fact, the word freedom was never mentioned until, at the end of class bell, when I told the class what theme first period came up with. And I could hardly contain my grin. All of these were themes the students tossed around toward the end of our discussion. Furthermore, the evidence they cited in the text supported these as the central idea of the story. Theme in literature might not be subjective (since the text must prove it) but it is open to interpretation. At the end of that second great discussion, I wished for Gilb’s phone number or email address. I wanted to ask him if one (or all) of these themes where indeed the meaning he intended to convey with this short story. Theme is the meaning the reader gleans from the story. Yep, it’s not about the author’s intentions at all. Sometimes, readers might discover the truth an author buried in plain sight within a text. Other times, their personal experiences and worldview might glean unintended ideas and meanings. The long introduction to theme in the lesson plans said, “Although readers may differ in their interpretations of a story that does not mean that any interpretation is valid.” They support this by saying that the statement of theme “should be responsive to the details of the story.” Meaning a reader’s experiences can’t outweigh the actual statements of the text. One of the girls in the second class said, “Well, that line shoots down my idea.” This when I read one sentence from the text which stated the opposite of what she was sure the author intended to say. Which of these themes was the one Gilb intended? Or did he have an entirely different meaning behind the writing? Truthfully, themes are an amazing way to concentrate analysis on a text. However, even in a short tale, there is the possibility that readers will have a takeaway that the writer never intended. Conversely, they might not “get” the point the author hoped to convey. Is it true that theme is open to interpretation (and thus subject to misinterpretation)? Do Real People have fatal flaws? Or is that reserved for fictional characters? Fatal flaw: the motivator or personality trait (key element) that causes a person’s downfall. In the early days of literature, this concept was called “hamartia.” Yes, it’s from Ancient Greek. I’m sure other literature majors who read this blog might recognize it. Sometimes I like to throw around terminology that might expand your vocabulary. As I’m developing the characters in my current book into deep, believable people, one area that needs attention is the idea of a fatal flaw. Because in literature, a good story is made better if a character’s fatal flaw is exploited. To help me with this, I found a workshop by Laurie S. Campbell. She discusses nine personality types and their corresponding fatal flaw. Sounds easy enough. For example, my heroine, Zi Yan fits character type eight: the Controller. Her background as the daughter of a wealthy businessman has enabled her to control many things around her. Unfortunately, there is one thing she can’t control – her visions of the future. But she tries. She limits her exposure to suggestions that might lead to a vision. I’ll just predict test scores and prom dates, she decides. Visions about these frivolous matters will occupy my mind so I don’t have to see death and destruction. Or not. So her fatal flaw is lust for control. She desires to run the show and do things her way. When working with a dragon, that is a highly unlikely scenario. If she can’t be in charge, then she will play an important role in things. And when she realizes her “gift” is not the one that will save the world, she has her dark moment. We have dark moments in real life, too. There are times when we feel all is lost and can’t see how to resolve the problem. So are these moments brought on by our fatal flaw? In my experience, I am a deeply flawed character. This should teach me that my story people should be deeply flawed if I want them to be believable and relatable. But is there one character trail that causes me to trip and fall on a regular basis? I’m not so sure. According to the list of character types, I best fit into the type one category – The Perfectionist. I know this comes as a total surprise to those of you who know me. If this list is accurate, my fatal flaw is supposed to be anger. Do I get angry at myself when I don’t measure up? Do I get angry at other people who don’t live up to my standards? It’s an interesting thought. One I’ll be pondering for some time to come. I can’t say whether I’ll share my determination with you. Unless there is an overwhelming response to this post demanding that I do. Are you willing to speculate on this topic? If so, you can find the character types and associated fatal flaws at this link. Check them out. Find yourself. Do you believe your fatal flaw matches up with your character type? Is there such a thing as a fatal flaw for real people? Feel the wind in my hair. See the passing scenery. Experience the joy only the telling of a good story births in my heart, soul and mind. Books too numerous to name have impacted me. Some of them changed my opinion or beliefs. Others resonated on a spiritual level. Many made me weep and many others made me bust out laughing. Only a select few meet my desire for authentic characters facing realistic foes in a story line that offered just enough tension to keep me turning pages. Even fewer have all this and poetic prose that ignites my imagination. I won’t say that the five books I’m mentioning here have all of those things. What they do offer: a thoughtful message in a bottle within a framework that makes it enjoyable to read. The other disclaimer I have is that these are books I’ve read in the past two years. They don’t represent the most important literature every young adult should read. Nor are they the most amazing books from that genre I’ve ever read. It’s a Pulitzer Prize winner, but that doesn’t guarantee anything. This coming of age story paints a realistic portrait of small town life, sibling rivalry, friendship, single parenthood and the importance of being true to what you believe. I’m not a fan of stories set during the Holocaust; they’re just too heavy. The original voice gives this book an edge over all the others. If it didn’t have a happy ending, it wouldn’t be on my list. The characters are tried by fire and come out refined. 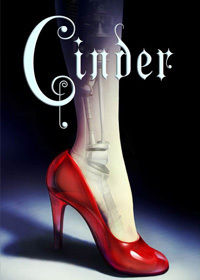 Not just another Cinderella story, this book tackles important issues like discrimination, governmental controls, and defining the fine line between medical research and murder. If a person has some cybernetic parts, does that mean they are less than human? This is the only “fantasy” on my list. If you’ve read these books, I welcome your comments about whether you agree with the “must read” status I’ve granted them. Sound off readers of YA books. What books would you add from the YA category that you consider “must reads” for all young adult readers? Embarking on yet another eight week tidal wave of mental expansion, I can’t help but smile. My beaming face dwarfs the sun. Of course, since I live in the rainy Northwest, it isn’t hard to eclipse that brilliant star. This time of year, the clouds do a fine job of it. Both of my classes are applicable to my major and they seem interesting. It looks like I will be reading so much for class that I won’t have time for any recreational reading. I may even have to trade in my fantasy “one chapter before bed” for school-related reading material. In the class description, the context of writing should educate students on the publishing industry. With course objectives like: identify and examine the driving forces of the literary marketplace and examine current trends in publishing, it appears I might learn something. Hopefully, the wisdom I glean will push me toward becoming published. If nothing else, it should at least help me determine if I’m going to go with traditional publishing, indie publishing or self-publishing. Every week I have to write a short paper for this class and I also will keep a blog through the eight-week term. At the end of the term, a six-page paper on the future of the book business will wrap up my publishing enlightenment. Finally, my senior level literature class has arrived. With it, To Kill a Mockingbird and a delightful anthology of short fiction taunt me with impending boatloads of reading assignments. In addition to reading Lee’s masterpiece, I must read another novel. I’ll analyze this novel’s themes around the premise of the class. You’ll love this cheerful theme we’re focusing on: the American ideal of loss of innocence. Should the loss of innocence ever be considered ideal? My final for the class is an eight-page analytical paper on this yet unnamed novel and a PowerPoint outlining its major themes. Along the way, I will have to write two other papers. Fortunately, the topics have already been given so I can begin the writing as soon as I’ve finished the reading. Did I mention I’ll be buried with texts and reading assignments for the next eight weeks? I’m hyperventilating from the weight of literary dirt over my thin casket of time. I was hoping that I might be able to get back to writing my novel this term. With the three blog posts per week, I’ve been barely keeping my head above water. Throw in two long term papers and some shorter essays every week for class, and I don’t see much creative juice being available for the novel. Should I be making time to write that? I always feel so guilty when I’m not doing schoolwork, and so I write in unfocused circular motion. While critics everywhere agree that Hamlet is Shakespeare’s most popular play, those same scholars find little to admire in the title character. He seems plagued by a “lack of will to act,” they say. While watching the 1996 Branagh version of Hamlet, I followed the text in my weighty textbook. A few additions (from another version of the text apparently) were the only variations from what Shakespeare penned hundreds of years ago. I enjoyed the film. While lengthy soliloquies covered a page in the book, the filmmaker gave visual flashbacks or cutaway scenes to explain what was being rambled on about in the tiresome speeches. It helped me understand the depths of plot that Shakespeare layered in this play. Hamlet, in a deep state of grief over the sudden death of his father, resents the marriage of his mother and uncle less than a month after the funeral. A visit by the ghost of his father directs him to wreak vengeance on his murderous uncle. Hamlet voices his own moral quandary for carrying out this revenge. It is this constant questioning and his need for verification of his uncle’s guilt that immobilizes him. What right does he have to be the executioner of this sentence? Won’t his vengeful retribution make him as much a murderer as his uncle? In the film, it was easy to see that Ophelia and Hamlet had a preexisting love relationship, but it’s nonexistent in Shakespeare’s manuscript. What motivated the only suicide in this play? Is it strange that I find the multiple murders at the end of the play preferable to the suicidal body count in the other three plays I’ve read this term? In fact, the true tragedy of this play is that a country is left without a monarch. An invader walks in at the end to claim the throne, the conquest for it accomplished by the royal family he deposes. Even though I enjoyed reading (and watching) this play enormously, I have to admit that Hamlet’s character isn’t the compelling ingredient. So many famous sayings and familiar quotes are in this play, it’s obvious The Bard outdid himself with the turns of phrase in this story. What do you think of Hamlet? Is he a hero? Who do you think was the hero in this play?